Plyometric workouts (or “plyo,” for short) have been espoused by elite athletes for years, and they’ve recently gained traction in the general fitness world. Our elementary-school selves were onto something, though, as plyometric workouts have distinct health and fitness benefits. Here’s what you need to know about plyometric workouts as you consider adding them to your fitness routine. What Can I Expect From a Plyometric Workout? We mentioned that plyo workouts involve jumping, but it’s much more structured than that. Throughout a plyometric workout, you engage in a series of explosive jumps, jump squats, and one-leg hops. Every time you perform a jump and land it, you stretch and fire your muscles. This combination of stretching and contracting (landing and jumping again) is one of the best ways to work your leg muscles. Unlike cardio or core exercises, you don’t want to add plyo to your routine on a daily basis. Your muscles will need a break after such intense exercise, so incorporate plyo about every three days. What Are the Benefits of A Plyometric Workout? While plyo shouldn’t constitute the bulk of your fitness routine, it can be a great option for athletes who want to condition their fast-twitch muscles. Plyo simulates the explosive muscle movements you’d perform during basketball (jump shots), baseball or softball (an infielder fielding a far-away grounder), tennis (a serve), volleyball (a spike), and just about any high-paced athletic competition you could think of. If you want to be at the top of your athletic game, you should strongly consider plyo workouts. Additionally, plyo adds a dynamic energy to your workout. 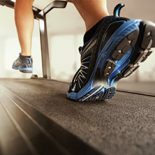 If you get bored running for miles on a treadmill, plyo is a much faster-paced workout you can perform. Even if you’re not an athlete but want to strengthen your legs and glutes, plyo could work for you. Where Can I Do a Plyo Workout? At our local gym in Bethlehem, we have the boxes and fitness space you need for a plyo routine. Our state-of-the-art fitness floor has ample space so that you can engage in this dynamic workout without worrying about falling onto the elliptical next to you. If you’re just establishing a fitness routine or want more guidance for a plyo workout, consider working with one of our personal trainers. Let them know your fitness goals and ask them if plyometrics makes sense for your body. To take your fitness routine to new heights (literally, see how high you can jump after a few weeks of plyo training), join Steel Fitness Riverport today. We’re a great option for anyone who’s searched “gym near me” to no avail, or for those specifically seeking plyo training. Register for a free three-day pass today and see what we’re all about at Steel Fitness Riverport!